Black Diamond's Alpine Bod is the original light alpine climbing harness, designed to meet general mountaineering needs. Thanks to its low price and rugged functionality, the Alpine Bod remains a popular harness (especially for mountaineering schools), though there are newer (albeit more expensive) harnesses on the market which match the Bod's performance and weigh less. The Alpine Bod may fall into the light alpine category, but it looks and feels reassuringly like a real-world climbing harness. Don't expect thin, delicate webbing or undersized buckles here: the Bod is a rugged piece of work, making it especially suitable in high-wear environments. The Alpine Bod employs a traditional, double-through buckle, plus quick-release buckles on the leg loops. This makes the harness attractive for ski mountaineers and winter climbers—you'll have no troubles getting into and out of the Bod without having to take off ski boots or crampons. Adjustability is one of the perks of the Alpine Bod's simple design. You'll have no trouble getting a good fit over several layers of clothing, or directly over your shorts. The Alpine Bod has four gear loops to rack your gear, and a rear haul loop. When you don't need it, the minimally-padded Bod packs up into a nice, tidy package that won't take up space inside your backpack. For general mountaineering use, the Alpine Bod may well be a perfect first harness. As you transistion from mountaineering to rock climbing, however, the Bod quickly begins to show its age. At fourteen ounces, the Alpine Bod isn't nearly as light as Mammuts Alpine Light Harness, for example. Neither is the Alpine Bod as comfortable as more modern light climbing harnesses, such as Black Diamond's Phoenix or Focus models. Comfort is especially going to pop up as an issue if you expect to do more than a few long rappels, or if you need to spend any significant amount of time in a hanging belay. You'll also likely begin to miss having a belay loop (which makes it easier to use and manage your belay device) if you're doing a lot of climbing and belaying. 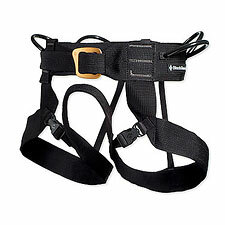 Obviously, sport and big-wall climbers will want to look elsewhere for their harness needs. Still, the simple, classic design of the Alpine Bod and its low price make it an attractive option for a wide range of alpine objectives.